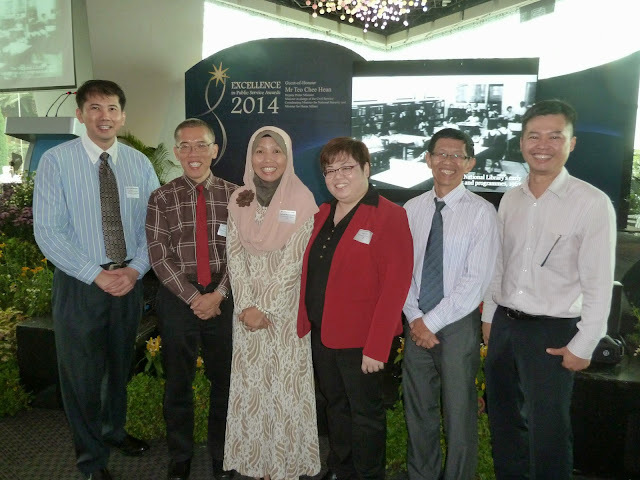 Excellence in Public Service Awards 2014 is an event to recognise public service officers for outstanding service and public organisations’ achievements in organisational excellence and in implementing best practices. This publication is an commemorative book of the event highlighting all the recipients of the awards. below is the write-up! thanks to Gabriel for supporting my nomination too! 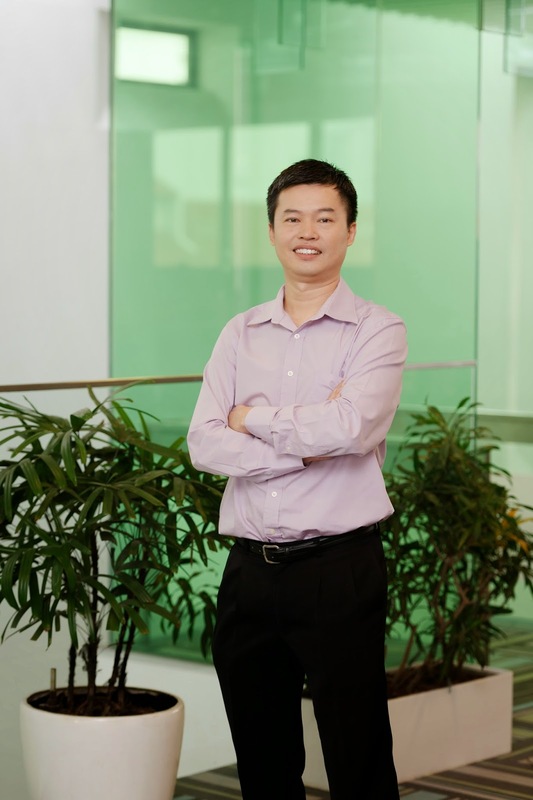 Wee Loo Kang Lawrence is a senior specialist at the Ministry of Education (MOE), Education Technology Division (ETD). His research focuses on designing Open Source Physics computer models, Tracker video analysis and modelling for physics education all free for the public of the world. world. Regardless of where the requests might originate, his service quality is always top notch. 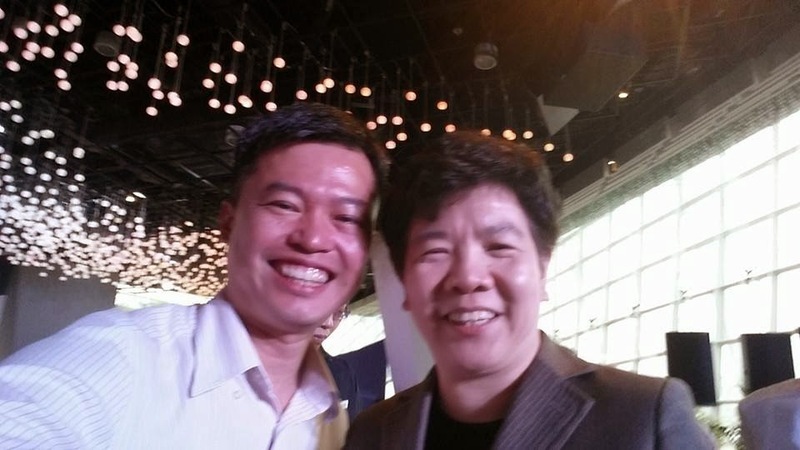 Kenneth Lee, Principal of Hillgrove Secondary School approached Loo Kang regarding gravity physics simulations curriculum materials to boost the school’s niche on flight and aerospace. Typically, if a vendor is to produce such simulations curriculum materials, the cost of developmentis usually a financially costly affair not to mention almost impossible to get students to learn through customization of simulations – “learning by coding”. Extra mile in service delivery/ exemplify Whole of Government (WOG) mindset? Lawrence responded promptly by providing a list of customized simulations related to flight and aerospace for the school’s immediate use. He also attends several meetings with this school’s teachers to understand their teaching need even though it is not within his job scope. Lawrence even went on to conduct a 3-day, 2 hourly workshops to 15 students to “code” a rocket model-simulation, which inspired many of the secondary three express students’ love for rocket-physics. The students appreciated the rationale for having such specialized pedagogy aims to better prepare them for the future despite the difficulties in learning by coding both in software and physics content knowledge mastery. The teacher in charge was very grateful to Lawrence for having gone the extra mile in mentoring his students to “learn by coding” as this is an advance pedagogical approach practice by computational physics professors in overseas universities. Excellent effort and work by the team! Keep it up J - Ho Peng Director-General of Education. 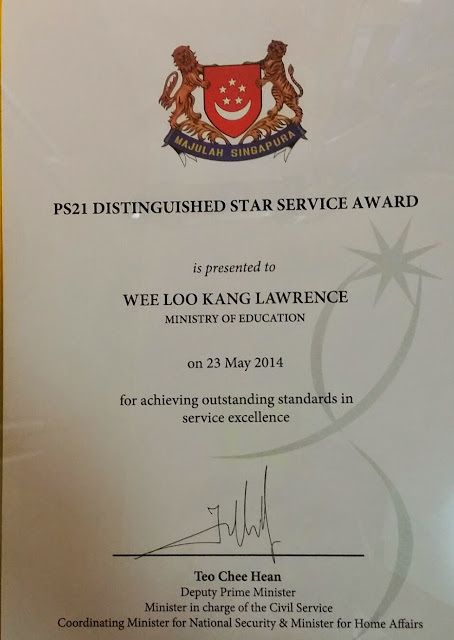 PS21 Distinguished Star Service Award? 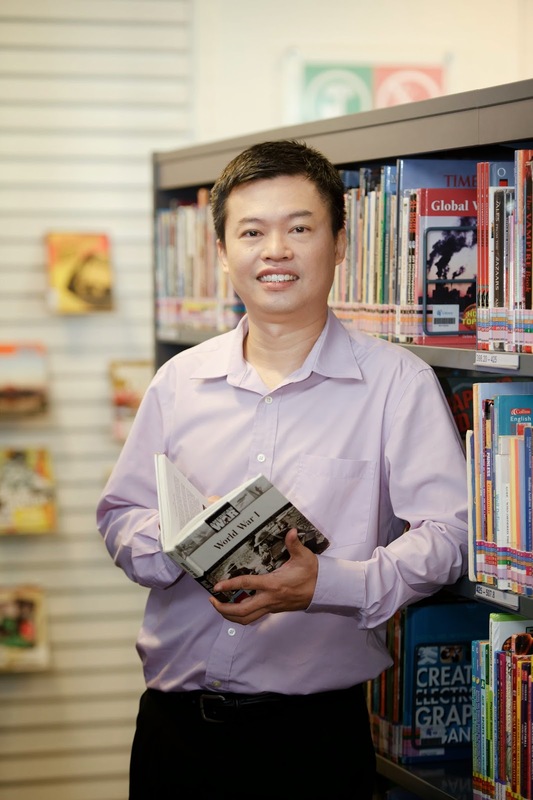 Loo Kang goes beyond the call of duty to continually customise Physics resources to make them suitable for use in the different schools and project contexts. With his close handholding of schools e.g. HCI and YJC, successfully scale the use of the video tracker for the learning of Physics. In addition, every feedback is taken into account to explore how the simulations can be improved. 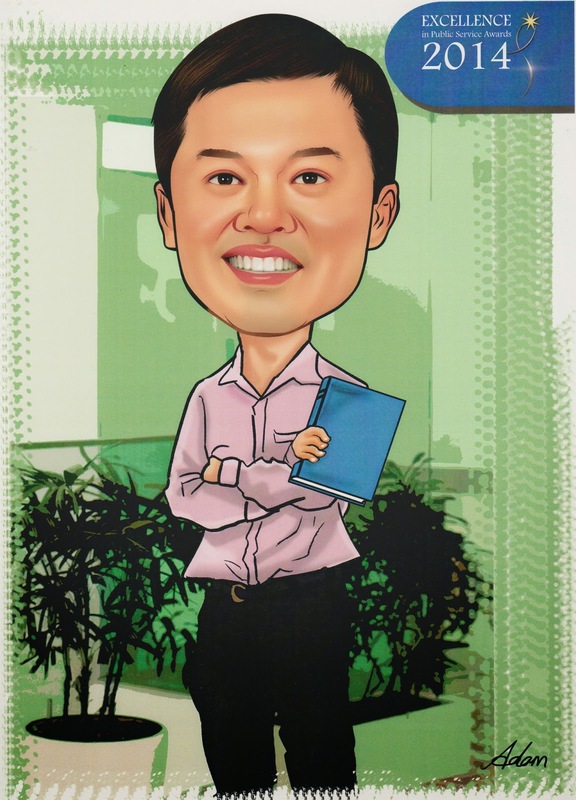 Loo Kang has garnered compliments from all levels ranging from teachers in schools to MOE’s senior management (e.g. PS and DGE), from local tertiary professors (Dr Darren Wong and Dr Zhang Bao Hui) to overseas ones (Dr Hwang F-K and Vasudeva Rao Aravind). 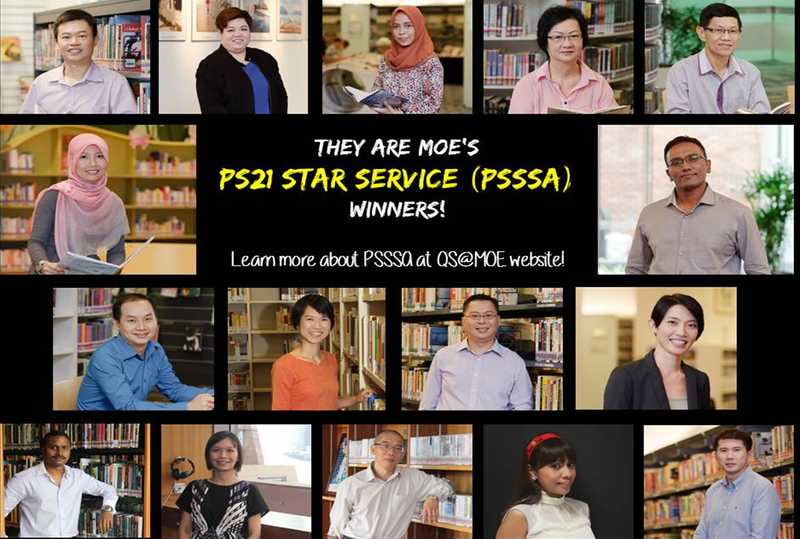 16 colleagues from MOE and MOE Statutory Boards will be awarded the PS21 Star Service Award (2014). write up to support my nomination is here. thanks to winston tan for the photo! Quality needed is the ability stay focused and true to vision of the Public Service. v2 actual used: Technology - Using Educational Technology to allow students to be interactively engagement thereby bringing out the best in every child. v1: There are many initiatives (21CC, mp3, teach less, learn more) and frameworks (cyberwellness, 21CC, C2015) being rolled out in my Ministry that require us to rationale and make sense, perhaps even make more vivid and better than the original localized intent. The world is already so connected through the internet, why not push our initiatives and frameworks to benefit young children in developing as well as other industrialized countries? If by spending 1 dollar more can make millions of children everywhere learn better through the internet, I say just do it because it is what public service is about, for the benefit of the general public. To experience the joy of students having evidence based discussions and having them to tell their perspectives on how we can improve the learning and teaching practices. There is always something to improve on and the feedback fuels my service and work. I also recently created a suite of TEN mobile devices enabled simulations and i emailed Physics teachers in almost all the junior colleges, and some of them replied back about how the were able to incorporate them into their existing teaching and practices, just make me happy. Some of the teachers even suggested ways to customized the simulations to better suit their practices, that really is a rewarding experience knowing that busy teachers find value in the work and service that i provide. Professor Hwang Fu-Kwun from Taiwan, Professor Francisco Esquembre from Spain and Professor Wolfgang Christian, USA are the 3 people's work and passion have inspired me to give away free and open sourced thousands of educational resources so that these simulations can be changed legally under the licenses of creative commons attributions and other compatible licenses like GNU. They are truly role models for me as they selflessly give their intellectual creations away for the benefit of all humankind, that the reason, I am who I am today, able to serve selflessly for public good. Once you can figure out 'why' you should be in the business of public service such as Ministry of Education like I have, you will be able to act beyond and do further then what is articulated and set yourself to achieve more lasting change for the benefit of all others, before self. If you are unable to meet the time for the photoshoot, you may submit your self-taken photograph to us. Should be brightly lit – not taken in dark places. We need a short write-up from you for our e-publication. What motivates you to serve/continue in your work? v2: 1. Make the world a better place for everyone. Just doing my humble part as an concerned citizen of the world by contributing to open educational resources, creating engaging and interactive computer models-simulations that support active learning for improving education all over the world. 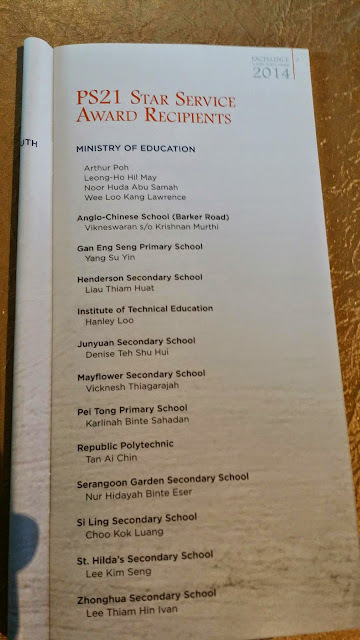 Thus my motivation is to serve students, teachers and the public with the well designed and customized simulations resources for the world, while being rooted in Singapore. v1: Make the world a better place for everyone. Just doing my humble part as an concerned citizen of the world bycontributing to open educational resources, creating engaging and interactive computer models-simulations that support self directed and personalized active learning for improving education all over the world, granting universal access to quality resources. This my motivation to serve students, teachers and the public with the well designed and customized simulations resources. How do you deal with difficult situations/customers? Can you describe a memorable event in your working life/made an impact on another individual or something that left a deep impression on you. One tip/advice for others to provide excellent service. Any other thing you want to share? yesterday's message of the day. 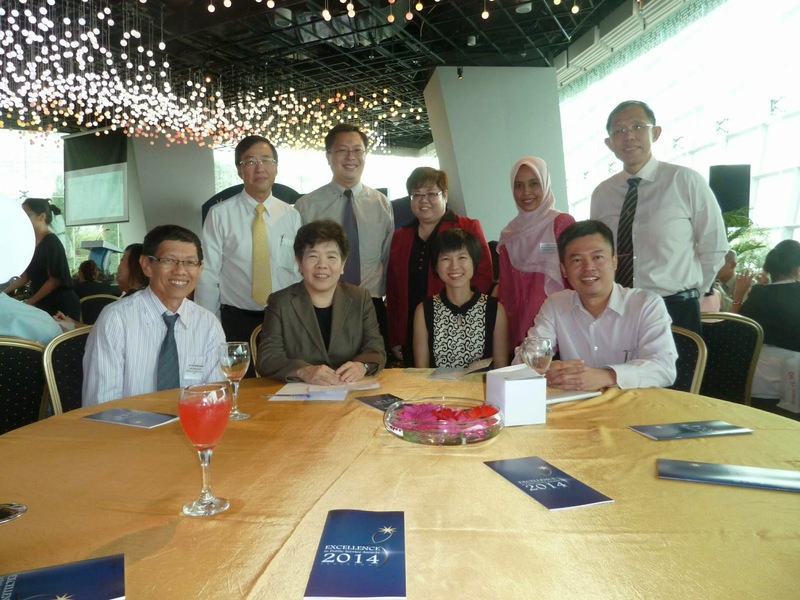 Do you know what is common among these 16 MOE public service officers? what do these 16 have in common? thanks to MOE customer service branch, SPPD. thanks to MOE customer service branch, SPPD on 30 june 2014.
thanks to MOE customer service branch, SPPD. 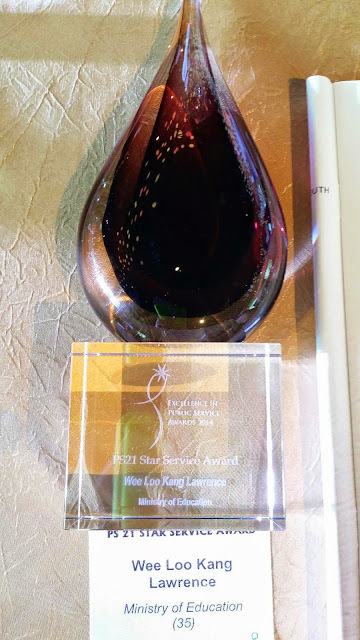 The PS21 Star Service Award (PSSSA) is a Public Service-wide award organized annually by the Public Service Division to recognize and reward officers who have consistently demonstrated high standards of service excellence. This award also encourages quality customer service and raise Public Service standards by identifying role models who display exemplary performance in service delivery. The PSSSA is driven by the belief that total organizational effort in showing recognition and care to our people is key to achieving service excellence. Well Said On the intranet. Winners for the Distinguished PS21 Star Service Award are selected by the PSSSA Judging Panel from amongst the nominees for the PSSSA. All PSSSA winners will receive their awards at the PS21 Star Service Award ceremony held in May each year to kick off Public Service Week. Distinguished Star Service awardees will receive special mention during the award ceremony. 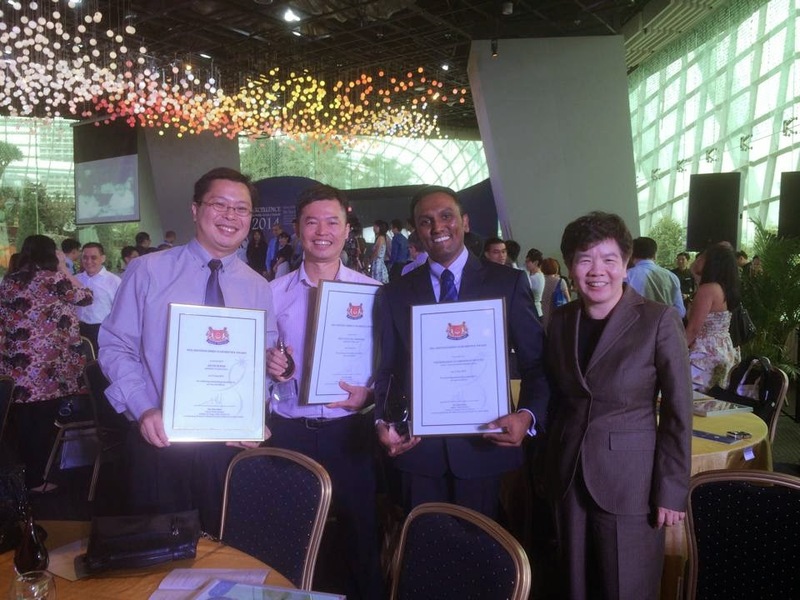 (Left to Right) Arthur Poh (photo from), Lawrence Wee, Vikneswaran and Lai Fung. Thanks to PS Education for joining the event! 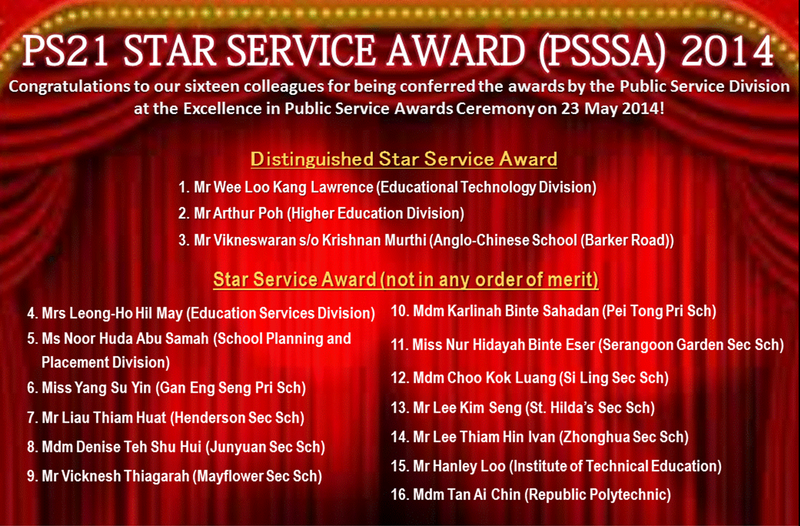 Distinguished Service Excellence in public service awards PS21 2014. 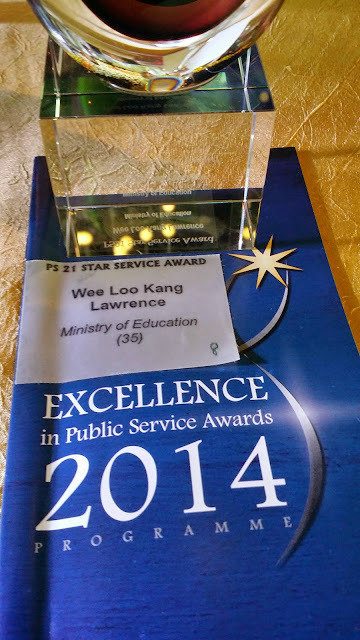 Distinguished Service Excellence in public service awards PS21 2014. 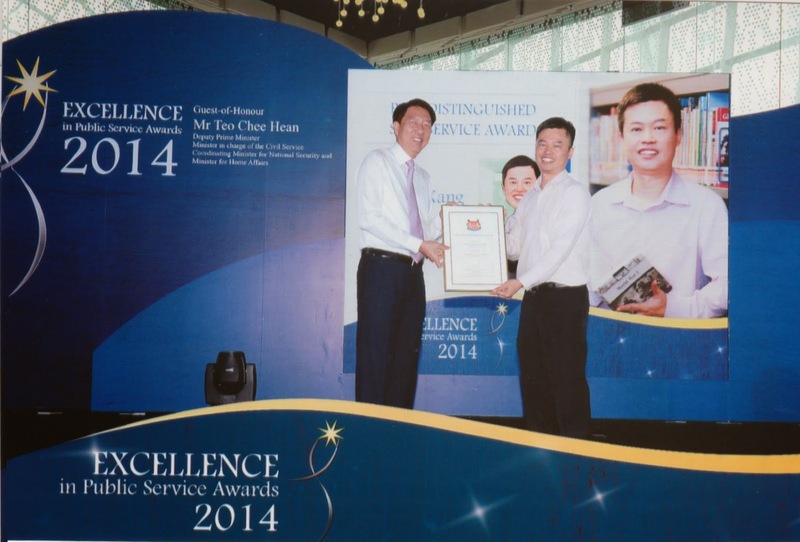 Only 10 Distinguished awards given out this year from 133 from all public services Singapore. With the Public Service Week, 133 outstanding performance this year will be in recognition of the civil service, of which 10 will be awarded the "PS21 STAR SERVICE AWARD". 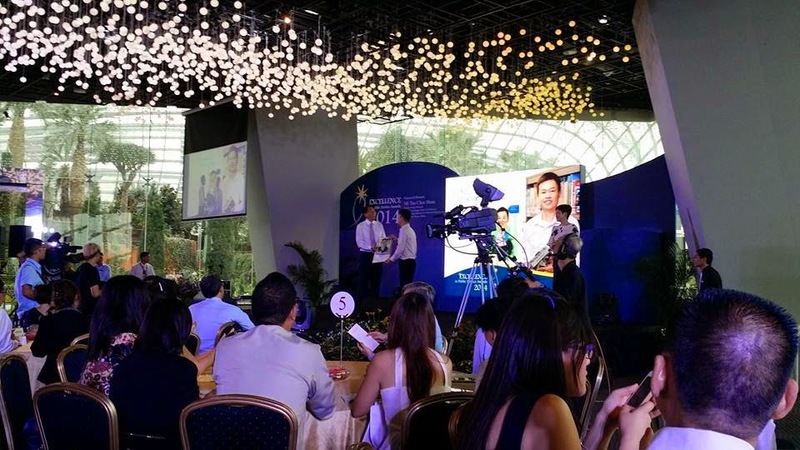 President Tan will also entertain the afternoon of 600 civil servants at the presidential palace, including this year was awarded the "PS21 DISTINGUISHED STAR SERVICE AWARD" from 133 civil servants. Many thanks to these 3 judges who judge me as worthy of the distinguished Award 2014.
thanks to peter ong for giving out the award. 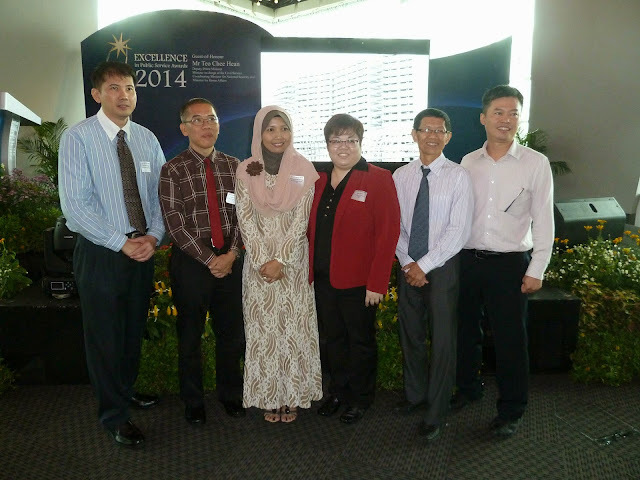 Interesting that we just spoke at the istana yesterday. 2. 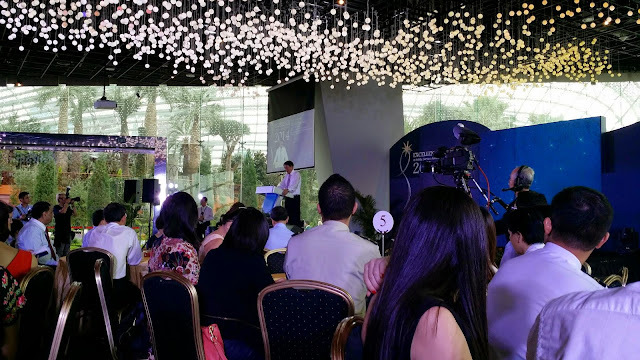 I am very happy to join you at this year’s Excellence in Public Service Awards Ceremony at this beautiful location here at Gardens by the Bay. 3. 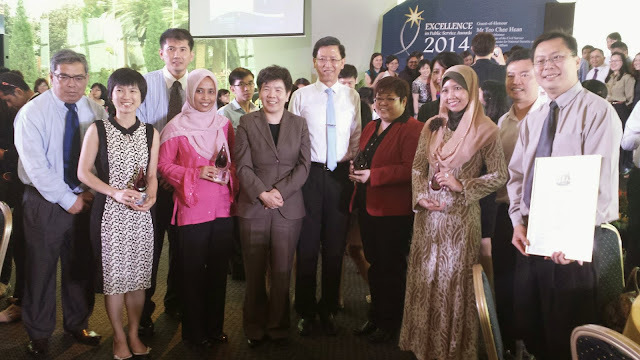 Each year, we recognise public agencies and public officers who have done well to improve the lives of Singaporeans. We also recognise fellow Singaporeans who have partnered public agencies in service delivery. 4. The Public Service’s mission is to develop policies and implement programmes that make Singapore better for Singaporeans. Our public service pioneers have brought Singapore from Third World to First: Growing the economy and creating jobs. Providing education, healthcare, and housing. Developing infrastructure such as roads and drains. Making Singapore clean and green and beautiful. Building up our defence and security capabilities while strengthening foreign relations. 5. They have provided a strong foundation for all of us to make Singapore even better as Singapore enters a new phase of development. We must continue to build on this foundation as the needs and interests of Singaporeans have become more diverse – due in part to better education, changing demographics, and broader and higher aspirations. Many Singaporeans also want to contribute their ideas and time to help make Singapore better – including how to improve public policy and services. How can the Public Service evolve to draw on their energy and ideas, to help Singaporeans achieve their aspirations, to build a better Singapore for all of us? 6. The Public Service must place renewed emphasis on “Working Together to Serve Singaporeans Better” in three areas. One, work more closely with one another, across agencies, to effectively resolve issues that Singaporeans face. Two, seek to better understand and respond to the needs of Singaporeans. Three, tap on the ideas and energy of Singaporeans, and create space for them to participate in the development of policies and implementation of programmes. 7. First, strengthening inter-agency collaboration. The issues and challenges that Singapore and Singaporeans face often cut across multiple agencies. To resolve such issues effectively, agencies have to see beyond their own mandates, and work closely together with one another. We must continue to nurture a strong One Public Service mindset among our public officers, and encourage stronger inter-agency collaboration, in order to deliver better outcomes. 8. The restructuring of some of our agencies to bring all pre-school issues, previously handled by different agencies, under the new Early Childhood Development Agency is one such example. This will help us provide stronger support to parents to bring out the potential in all Singaporeans from an early age. This is one of our priorities. We are also setting up Social Service Offices to provide more coordinated and integrated care to needy Singaporeans. These new agencies have already started to deliver better outcomes. 9. Government services have also been restructured to deal with day-to-day issues. In March 2012, the Agri-Food and Veterinary Authority set up the Animal Response Centre as the single point of contact bringing together multiple agencies to resolve animal-related issues speedily and effectively. For stepping up to deal with these issues, AVA will be receiving the Best Practice Award in Inter-agency Collaboration today. 10. Second, being more responsive to changing needs. 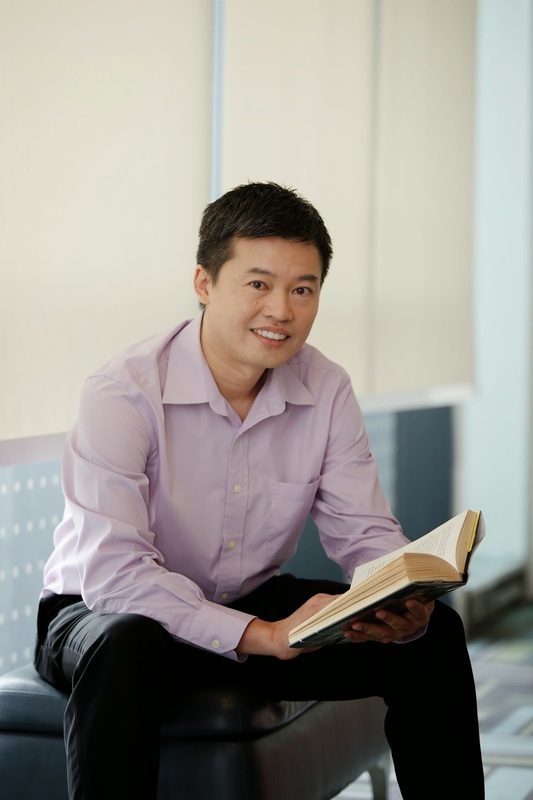 The needs of Singaporeans have grown more diverse, and are changing more rapidly. Public agencies and officers must understand the concerns and interests of Singaporeans and adjust policies and programmes to meet these changing needs. 11. Some rules and processes may be outdated or no longer relevant. Let me give one recent example. For security reasons, mobile phones with cameras had not been allowed in MINDEF and SAF camps. However, such a rule was increasingly inconvenient and impractical for our NSmen. Mobile phones with cameras had become the norm rather than an exclusive feature only for some; phones without cameras were becoming a rarity, almost a museum piece. MINDEF therefore took in these concerns from our National Servicemen and allowed mobile phones with cameras, but in a tiered approach, in less sensitive areas. The majority of NSFs and NSmen can now continue using their mobile phones while in camp. This helps them to balance their NS duties with their work and family commitments. At the same time, MINDEF too balanced its security needs with the needs of our National Servicemen. 12. Third, encouraging participation. (does sharing this video count as participation? 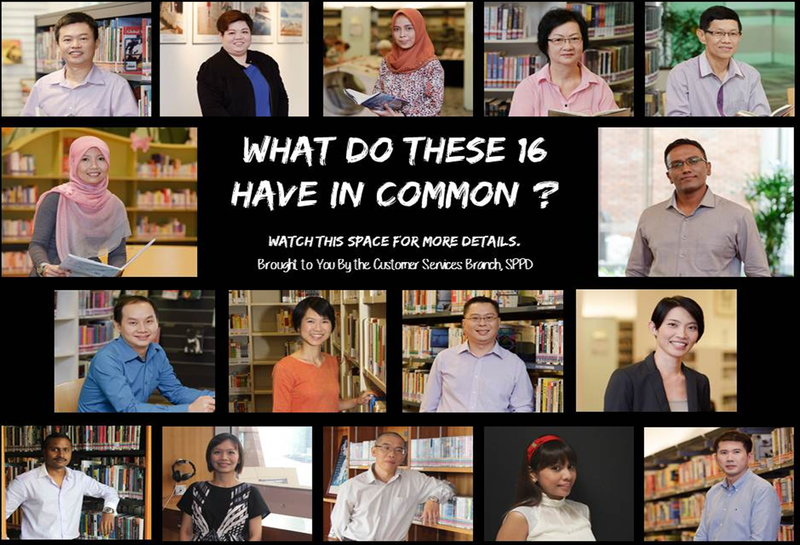 :) )With a better educated and more diverse population, we are seeing more Singaporeans who are willing and able to contribute their ideas, time and services to improving public service delivery. Public agencies can benefit by finding new ways to engage and involve our citizens to jointly develop and implement solutions to issues that matter to them. 13. Recognising the importance of involving stakeholders early, the URA put out a Draft Master Plan 2013 to solicit views from fellow Singaporeans and other stakeholders, so that their views could be incorporated into the eventual Master Plan. 14. URA found that the community and stakeholders appreciated being kept informed of future plans early. URA benefited from the good ideas from different stakeholders, and Singaporeans were better able to appreciate the diverse needs of different interest groups, and the considerations behind the Draft Master Plan 2013. 15. We are also happy to see more Singaporeans coming forward to contribute their time and effort. 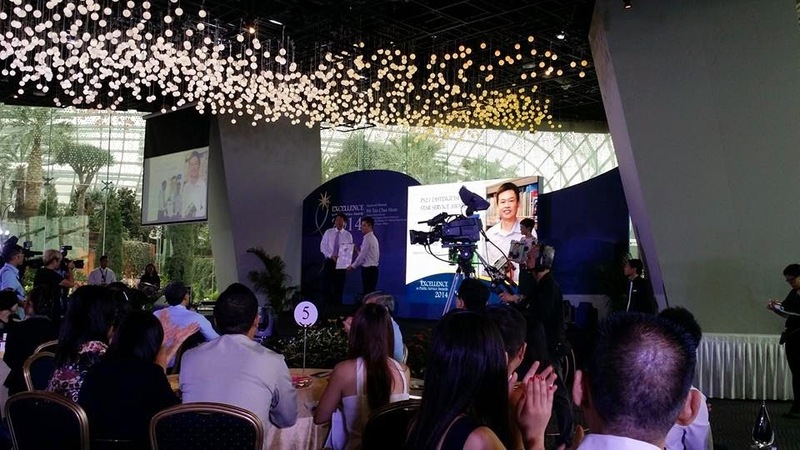 Five Singaporeans, Mr Abdul Hamid, Mr Anthony Au, Mr Loh Wan Heng, Mdm Saniah and Mdm Yeo Chwee Fong will be receiving the PS21 Star Customer Award today, for their active contributions to public service. Thank you for working together with our agencies to make life better for all of us. I encourage public agencies to consider new areas and find new ways to tap on the ideas and energy of fellow Singaporeans, to help us develop better policies and programmes, and to help us have a sense of ownership to build our Singapore together. 16. We have many public officers who are passionate about improving the lives of fellow Singaporeans. 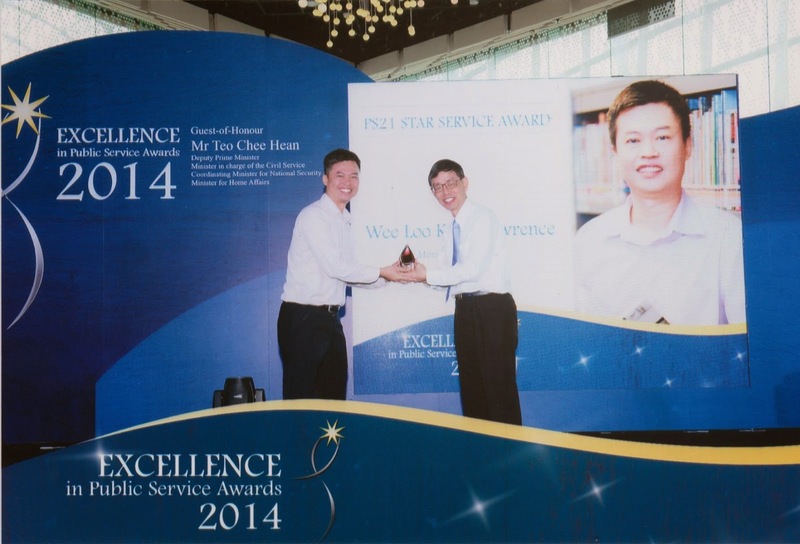 133 public officers will receive the PS21 Star Service Awards this year. 17. Mr Lu Juncai from the People’s Association is one of them. His job is to promote and market Community Centre (CC) activities, courses and events, and encourage residents to sign up for CC membership. However, he has not let his job scope limit his service to the community. 18. One day, Juncai received a call requesting for financial assistance from a resident. Instead of passing on the request to his colleague whose job was responsible for financial assistance, he decided to meet the caller over lunch to understand his situation better. The caller was a 54 year old man who was single, suffers from kidney failure and was unable to work. With a listening ear and a better understanding of the situation, Juncai facilitated his colleagues’ and the grassroots leaders’ efforts to provide financial assistance for the resident. He sought to understand the factors behind the immediate issue, and took action beyond the scope of his duties. This brought about a better inter-agency and community response to provide the necessary assistance, to extend help with a heart to a resident in need. Thank you Juncai for doing so. 19. Many of our officers tell me that the work you do is deeply satisfying and meaningful, and you find fulfilment from making a difference to Singapore and our fellow Singaporeans – and that is why you are in the Public Service. 20. Besides the 18 agencies and 133 officers receiving awards this year, many front-line agencies and many public officers have done good work in the last two years to improve service delivery and policy responsiveness. I hope our award winners will inspire all of us to do even better. 21. Today, we also come together to re-affirm the Public Service values of Integrity, Service and Excellence. To remind ourselves that we must work together as One Public Service, united by these values. To commit ourselves anew as a Public Service that works together with our fellow Singaporeans to build a better future for ourselves and our children. To dedicate ourselves to Working Together to Serve Singaporeans Better. 22. Thank you for your good work and dedication. a message from Public Service, to celebrate each and every public officers contribution to a better Singapore.